California relies on the Sierra Nevada snowpack for a significant portion of its water needs, yet scientists understand very little about how future changes in snowpack volume and timing will influence surface water and groundwater. Now researchers at the Department of Energy's Lawrence Berkeley National Laboratory (Berkeley Lab) are developing an advanced hydrologic model to study how climate change might affect California watersheds. "We will use a high-resolution and physically based numerical modeling approach for simulating how water moves from the atmosphere to surface waters and into groundwaters," said scientist Erica Woodburn of Berkeley Lab's Earth and Environmental Sciences Area. "Water management across the state currently relies on simpler models that have been calibrated and made to work correctly with historical data. But because we are likely moving into a future where water delivery may be very different from past years, there is significant uncertainty in the use of these current models to predict the distribution of future water." The three-year project, titled "Headwaters to Groundwater: Resources in a Changing Climate," is led by Jeff Dozier of UC Santa Barbara, and includes researchers from Lawrence Livermore National Laboratory, UC Davis, UC Irvine, UCLA, and UC Merced. Woodburn, a hydrogeologist by training, along with Carl Steefel, head of Berkeley Lab's Geochemistry Department, will develop a mechanistic numerical model of the Consumnes River watershed, which extends from the Sierra Nevada to south of Sacramento, ultimately feeding into the Sacramento-San Joaquin River Delta and the California State Water Project, the major source of water for much of Southern California. "It's a really interesting watershed because it's one of the few, if not the only major flowing river from the Sierra Nevada mountain range without a major dam," Woodburn said. "So it's a rare natural experiment where we can isolate effects of climate change and water management because it doesn't have large water management activities. We can employ the model to explore the effects of climate change or land use on hydrological and ecological systems." The team's model will span from the lower atmosphere through deep subsurface geologic units, a region coined "the critical zone" by earth scientists given its important role in many environmental processes. 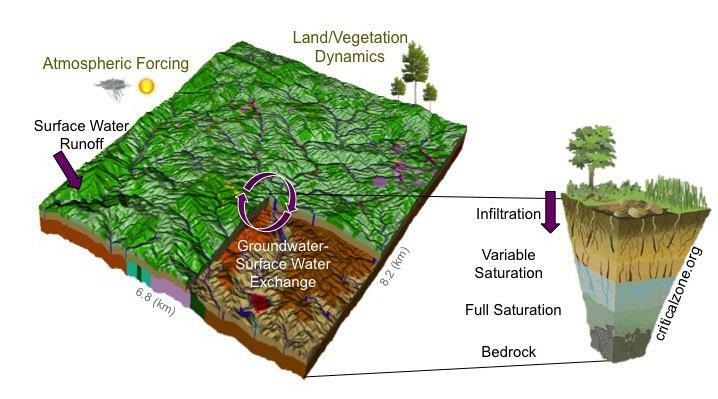 The model will include 3-D groundwater flows, the interaction between groundwater, surface water, and vegetation covers, as well as anthropogenic processes such as groundwater pumping, reservoir management, and urban water use. "Even though California historically has periods of dry and wet years, there isn't an analog for climate extremes like the ones we've observed in recent years, such as those record-breaking prolonged periods of drought following by periods of intense precipitation pulses that cause flooding," Woodburn said. "The need for accurate models to guide future water management, the likelihood of a 'new normal' water cycle in California, and the increasing availability of high-performance computational approaches to physically simulate how water moves at the surface and in the subsurface make this new project very timely." One hypothesized effect of a warmer climate is that it changes the timing of the hydrologic cycle. "With snowpack melting earlier in the year, that has a cascading effect on when the growing season of montane environments begins," Woodburn said. "As vegetation becomes more active earlier in the season, more water will leave the system in the form of evapotranspiration earlier, which could potentially create a lot of uncertainty in the availability of water. These are the types of feedbacks we can investigate with a physically based numerical model that jointly considers surface and groundwater interactions." The Cosumnes River watershed traverses a broad range of the state's terrain, from mountains to the Central Valley's agricultural lands to urban areas. "The groundwater-surface water exchanges at these interfaces are really important and largely unknown," she said. "The novelty of our model is it does account for some interdisciplinary transfers of water, such as feedbacks between groundwater storage and, for example, vegetation at the land surface. The physics of those processes are really difficult to incorporate in high-resolution models and require the use of high-performance computing." The team will perform the simulations at Berkeley Lab's National Energy Research Scientific Computing Center (NERSC), a DOE Office of Science User Facility. Once the team validates that the model is working correctly, the scientists will be able to run scenarios. "For example, how might groundwater levels and streamflow discharge change if we have a warmer winter with less snowpack, and how might that be different if the year prior was very dry or very wet?" Woodburn said. "You could use the model to make those projections."